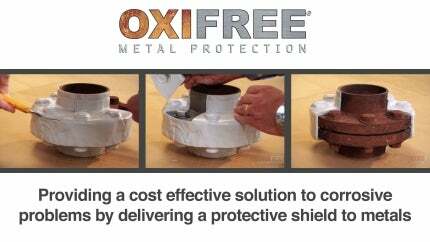 Oxifree UK is at the forefront of specialist anti corrosion engineering and metal protection within the UK and Europe for the offshore oil and gas sector. With years of experience and offices in 26 countries, Oxifree is quickly becoming THE brand and supplier recognised by the offshore oil and gas industry. Cheaper, lesser quality brands may come and go, but Oxifree remains the leader in offshore corrosion protection and the reliable option when it comes to ensuring and extending the life of assets. Offshore Corrosion prevention, a myth? Unfortunately, corrosion and the predatory degradation of vital components is every engineer’s problem and nightmare and the cost of dealing with this relentless issue ends up swallowing up large portions of budgetary constraints, that should be set aside for development, forward momentum and investment. From seized gate valves to galvanic instigated corrosion on flanges and piping joints, corrosion is every FM contractors and operator’s problem. What if there was a way to protect assets from corrosion regardless of shape, movement or complex design? What if there was a way to coat and forget assets and not worry about them for more than 20 years? What if there was a way to plan for the future and safeguard funds for development, for jobs and for the future? If there were a way to apply a simple coating to assets, to complete valve units, to flanges and pipe supports, that offers more than 20 years of fit and forget solution and if there were a way to arrest any degradation / further degradation of aging assets that still function with NO surface preparation or to protect new installations and guarantee that in 20 years’ time they will still look and function like new, would you take it? Would you invest in a method that is proven to work, that will slash maintenance and contractor fees? Can the oil and gas companies and contractors of, in this current era afford not to? Oxifree provides a solution to corrosion, which is endemic in the offshore sector and indeed within the marine and onshore chemicals, GNO and DNO networks. Oxifree is an eco-friendly organic resin substance that creates a protective barrier from the elements and actively protects and nullifies the impact of corrosion on metallic surfaces. Oxifree (TM198) is an easy-to-apply, sprayable, organic polymeric resin coating used to provide protection for metallic components. It consists of inhibitors that guard against all corrosive elements and can be reused and recycled. The machinery and equipment is ATEX zone 2-22 and IECEx certified and the material is also eco-friendly due to it containing less than 0.5% volatile organic compounds (VOCs), so there is no impact on the environment. Used by a simple heated unit, it gives a pliable polymeric barrier coating that can be used on all types of metal components. It has been designed for use on equipment that is prone to damage from corrosive water and dust particles, such as flanges and valves on process piping. Corrosion is the most persistent safety risk to offshore installations, with all operation equipment vulnerable. These form part of ‘safety critical elements’, which can disrupt operations if damaged. Corrosion protection is generally provided by paint, grease, galvanising, nickel-plating or using resistant alloys that can prove expensive. Oxifree has undergone extensive testing and is now the anti-corrosion solution of choice for CoP, BP, Petrobas, Centrica and VPI, SSE to name a few and is used on platform-critical components. Corrosion-control specialist Oxifree is to demonstrate its products at the Offshore Technology Conference (OTC) 2015, which is taking place in Houston, Texas, US, between 4 and 7 May. Corrosion within most engineer divisions is a problem which is a continual losing battle with no end other than expense. Unfortunately there is no escape from corrosion-instigated detrition of metallic structures. The fight against corrosion costs the UK around 4% of GNP per annum. Key to this fight are the establishment and promotion of sound corrosion management practice, the advancement of cost-effective corrosion control measures and a sustained effort generally to raise corrosion awareness at all stages of design, fabrication and operation. Roller bearings and gearboxes suffer greatly in areas prone to penetration of particles and humidity, greatly reducing the useful life of the bearings. By using Oxifree a totally new and efficient protection through the application of a polymer resin that encapsulates the whole surface of the equipment and prevents any contamination, maximizing the life of the equipment. Corrosion is, within most engineers divisions, a perpetual problem, which is fundamentally, a losing fight with no end other than expense. These problems are dramatically increased within the water industries, as population increases, the demand for water and the necessary removal of waste are of paramount importance to the availability of water for fire treatment and pollutants. Corrosion within most engineers divisions is a problem which is a continual losing battle with no end other than expense, unfortunately there is no escape from corrosion instigated detrition of metallic structures. The annual cost of corrosion worldwide is a staggering $1.8tn, which is over 3% of the world's GDP (Gross Domestic Products) and costs the UK individually around 4% of GNP (Gross National Products) per annum. TOTAL SA is a French state-owned multinational oil and gas company and one of the six 'super major' oil companies in the world. Its businesses cover the entire oil and gas chain, from crude oil and natural gas exploration to refining. Sahaviriya Steel Industries (SSI) and TATA Steel are currently undertaking a £9bn site rejuvenation project at Teeside that will see steel manufacture for global distribution being undertaken at the site. The rejuvenation programme involves site and utilities assessment and cost reduction to limit spiralling maintenance costs. Talisman Energy Inc. is a global upstream oil and gas company, headquartered in Canada. Talisman has three main operating areas: the Americas (North America and Colombia), south-east Asia and the North Sea, with an active exploration programme across all three. Oxifree UK were asked to provide SSE (Scottish and Southern Energy) a solution to costly SF6 gas release from GIS and SPL type circuit breakers on PowerStation's and substations in the south of England and Scotland. Oxifree UK were asked to partake in a trial coating of the concrete 'muffs' at the base of electricity pylons to provide an environmentally safe, long term protection to the concrete. The 'muff' is a thick concrete support that bares the weight of the pylon and is the interface between the pylon and the earth. Historically, the muffs have been coated in bitumen, which is dangerous for livestock / the environment. Interconnector (UK) Limited operates a subsea gas pipeline and terminal facilities to provide a strategic bi‐directional link between the UK and continental European energy markets. Great Yarmouth Power Station's operator RWE had commissioned work to upgrade the leak defences of the gas condensing unit situated onsite. RWE had to ensure that the unit was fully maintained as it faces directly onto a public highway. Sullom Voe Terminal is one of the largest oil and liquefied gas terminals in Europe. Its main purpose is to act as a buffer between the producing fields offshore and the tankers waiting to ship oil to the refineries worldwide. Oxifree UK is proud to announce the opening of new premises in the prestigious West Hill district of Aberdeen. Oxifree® is the ultimate solution to complex corrosion and contamination issues, having been successfully tested by industrial giants such as BP, Talisman, Chevron, BHP, Interconnector, BIS and SSI. GEV offshore, specialist engineering and access company for the marine sector, is exhibiting at the Offshore Technology Conference (OTC) 2013 at Reliant Park, Houston, Texas, US, on 6-9 May 2013.